The Lab Brick LMS Signal Generator series of USB-compatible synthesized signal generators cover the X-band frequency from 4 GHz to 20 GHz with low phase noise, fast 100 microsecond switching time, and fine 100 Hz frequency resolution. They require no additional DC supply voltage and offer advanced features such as phase continuous linear frequency sweeping, internal/external 10 MHz reference, and optional pulse modulation. GUI software can track and control several connected signal generators, simplifying multiple-signal test setups. Each device stores settings in internal memory, allowing it to power up in a specific instrument state. Each device comes with a USB flash drive containing the GUI software and digital version of the programming guide, along with a 6' USB cable. They measure 4.90 x 3.14 x 1.59 in. (124 x 80 x 40 mm) and weigh less than 1 lb. (0.45 kg). 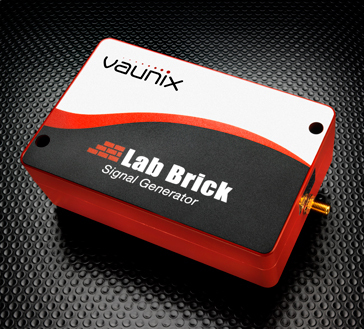 In non-USB applications, the Lab Brick® signal generators can operate with battery power or remote power supply. For automatic-test-equipment (ATE) applications, a programming guide is available for each Lab Brick® signal generator. In addition, they are programmable by means of LabView software drivers from National Instruments (www.ni.com). Lab Brick® signal generators comply with international requirements for electromagnetic-compatibility (EMC) emissions and immunity for Class A ISM devices to ensure that they don't interfere with other ISM-band equipment. All Lab Brick LMS Signal Generators are ROHS compliant and can be used with any PC or laptop computer with USB 2.0 port (or powered USB hub) and running the Windows 2000, XP, Vista, or Windows 7 operating system.